BA, easyJet, BMI and Virgin have warned Justine Greening that they expect delays and disruption to air traffic around London during the Olympics, unless measures are taken to improve management of air space. They say the major airlines and air traffic controller bosses had together come up with a list of potential solutions to the expected air chaos caused by the extra traffic during the Olympic period – particularly the three days before the Games, the period of the men’s 100 metres final, and the period immediately after the closing ceremony. They want temporary permissions to be given to airlines, airports and NATS to work differently during the games, to avoid delays and reputational failure of the UK. The airlines and air traffic controllers have been calling for more flexibility to prioritise the bigger airports such as Heathrow and Gatwick over smaller airports such as Farnborough in Surrey during times of highest demand. Millions of passengers face air chaos during this Summer’s Olympics unless the Government acts now to prevent a disaster, British Airways and the UK’s leading airlines have warned Transport Secretary Justine Greening. In a leaked letter obtained by the Daily Mail, the bosses of BA, Virgin Atlantic, BMI British Midland and Easyjet warn Miss Greening and her aviation team that they will be acting in a ‘foolhardy and reckless’ manner if they ignore the warnings contained in their two-page missive. The near apocalyptic letter spells out how the airlines, air traffic controllers and the aviation industry believe ministers have not been listening to their repeated warnings of the impending chaos at airports and in the airspace above Britain and have rejected up to five solutions. It states bluntly that there is now a ‘significant risk of severe delay and disruption at all of London’s major airports unless urgent action is taken’ causing misery to the millions of passengers who will fly into the Olympics this summer. The airlines also warn of their ‘significant concerns that insufficient progress has been made regarding the resilience of the airspace’ through which thousands of planes will take off and land during the sporting extravaganza. 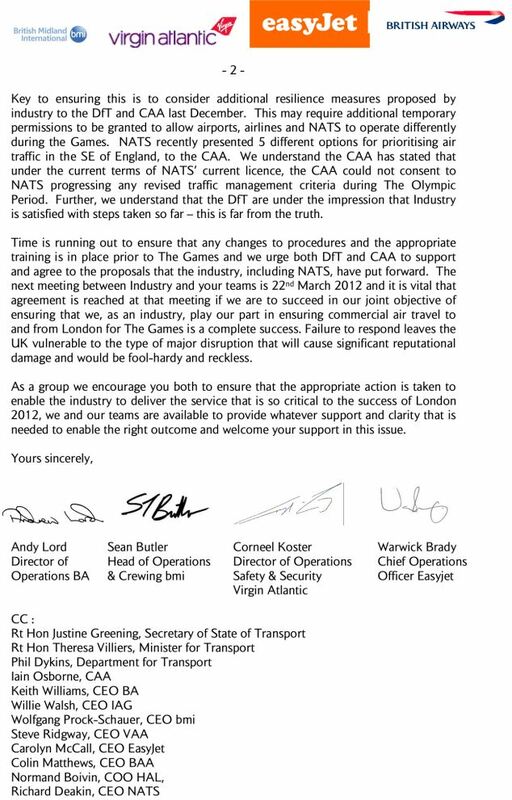 The letter says: ‘All of the major UK airlines, major airport operators and NATS believe that further action can and must be taken to ensure the impact on both “business as usual” travellers and visitors to London 2012 is reduced and that appropriate mitigation is available in advance of and during the period of the Games. The words ‘urgent action’ are printed in bold to ram home the point. The letter gives a stark ultimatum to the Government about the scale of the impending crisis, concern about ministerial inaction, and an action plan of what needs to happen before a crunch meeting set for March 22. The letter says bluntly: ‘Time is running out to ensure that any changes to proceedings and the appropriate training is in place prior to the games. 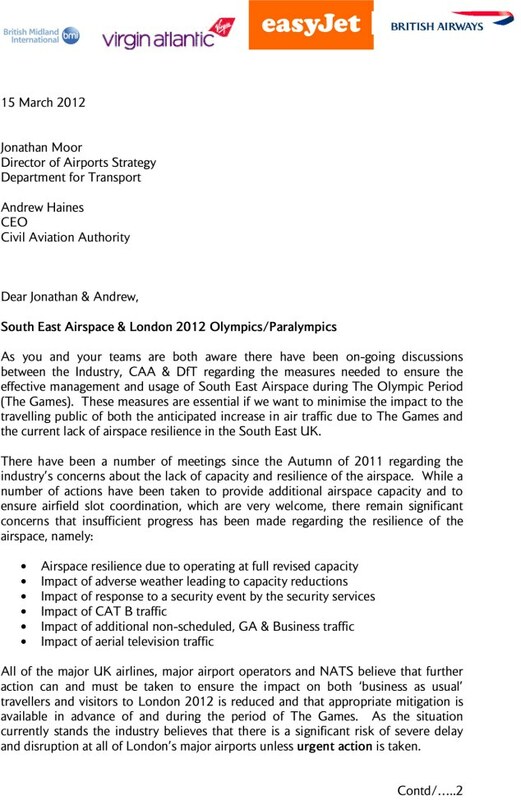 The letter stresses that an agreed solution is ‘vital before the March 22 meeting if we are to succeed in our joint objective of ensuring that we as an industry play our part in ensuring commercial air travel to and from London for the Games is a complete success’. The letter was sent by the operations chiefs of the four major airlines whose emblems fly at the top of the first page – BA, Virgin Atlantic, Easyjet, and BMI British Midland. It was sent to Jonathan Moore, the Director of Airport Strategy at the Department of Transport and to Andrew Haines, chief executive officer of the Civil Aviation Authority (CAA). The letter was copied in to Transport Secretary Justine Greening, Aviation Minister Theresa Villiers and a host of leading industry figures including BA chief executive Keith Williams, BA’s Willie Walsh who is chief executive parent company IAG; Virgin Atlantic boss Steve Ridgway, Easyjet boss Carolyn McCall, the head of airport operator BAA, Colin Matthews and the head of Britain’s air traffic controllers at NATS Richard Deakin. It is signed by British Airways’ director of operations Andy Lord, BMI’s head of operations and crewing Sean Butler, Virgin Atlantic’s director of operations, safety and security Corneel Koster, and Easyjet’s chief operations officer Warwick Brady. One insider close to the row said that the major airlines and air traffic controller bosses had together come up with a list of potential solutions to the expected air chaos caused by the extra traffic during the Olympic period – particularly the three days before the Games, the period of the men’s 100 metres final, and the period immediately after the closing ceremony. The senior source said frustrated airline chiefs believe ministers are ‘burying their heads in the sand’ by suggesting that the industry had raised no concerns. Their letter, dated Thursday March 15 and copied in to Miss Greening and her team, is their riposte to that. In simple terms, the airlines and air traffic controllers have been calling for more flexibility to prioritise the bigger airports such as Heathrow and Gatwick over smaller airports such as Farnborough in Surrey during times of highest demand. The airlines believes ‘insufficient progress’ has been made with the CAA and the government when planning to cope with the expected extra flights, the impact that sudden and adverse weather could have if flights are cancelled, the impact of a ‘security event’ or the response of the security services to it, the effect of non-scheduled additional general aviation and business traffic, and even the impact of aeroplanes and helicopters used by television companies to get aerial shots. The airlines say they sought additional ‘resilience measures’ from the Department for Transport last December. Measured sought additional ‘temporary permissions’ to allow airports, airlines and air traffic controllers to operate more flexibly and ‘differently’ during the Games. The letter sets out how air traffic controllers recently presented ‘five different options for prioritising air traffic’ in the southeast of England. But it was rebuffed because the CAA claimed that under the current terms of the National Air Traffic Services (NATS) licence, the CAA ‘could not consent’ to any revisions of the traffic management criteria during the Olympic period. Earlier this year, airport officials admitted that passengers arriving at Heathrow during the Olympics face the threat of baggage chaos as thousands of athletes and officials bring in up to three times as much luggage as normal. Heathrow said there will be a 45 per cent increase in the number of passengers arriving on July 26 alone, the day before the Olympics’ opening. There is a lot of information on planning for the Olympics in a CAA presentation at http://www.caa.co.uk/docs/1908/2012OlympicsAirspacePlanning.pdf dated 2011. It contains sections from NATS, ACL, the CAA and the Home Office. 8.1 Under normal weather and operating conditions and assuming compliance with slot regulations, NATS is confident that there is sufficient capacity in the ATM system to adequately accommodate the additional expected Olympics traffic without disruption. 8.2 Although the new temporary controlled airspace will provide additional capacity, it should nonetheless be anticipated that additional ATM regulations will be required during peak periods with potentially significant delays during peak periods. The reasons may include one, or a combination, of a variety of factors such as bad weather, MoD security flights, runway over-demand, non-compliance with the ACL slot regulations, or traffic bunching. All of these factors are beyond the control of NATS yet we must safely manage the resulting complexity. 8.3 The industry will need to be prepared, and the CAA will need to be flexible and responsive on a tactical basis throughout the Olympics period to the various types of disruption risk, particularly if more than one of these risks was to be coincident. Ø Prioritisation of certain aircraft types or flights over others. 8.5 The CAA has acknowledged the risks that various stakeholders raised, primarily around lack of resilience of London’s airspace today and the forecast additional Olympics traffic, combined with heightened security considerations, which meant there was a real and significant risk of widespread disruption. The CAA confirmed in February 2012, that it will progress, with industry, the risks identified which NATS does not have the authority to progress, including some of the items listed in 8.4 above. 8.6 The CAA and NATS have held discussions recently to establish the extent to which the restrictions on NATS imposed by its Licence and the Transport Act, might limit NATS’ ability to exercise the full range of operational decisions that its customers might desire, across a range of situations in which the resilience of the network was adversely affected. 8.7 The overriding principle established by the Licence is that any operational decisions must not unduly favour any particular aircraft or class of aircraft user. However, some reasonable latitude is allowed to deviate from that principle, taking into account a need to operate the route network as a whole, as efficiently as practicable. 8.8 The result from those recent meetings is that NATS is preparing a range of possible operational responses to potential scenarios designed to respond to customer needs, balanced with network efficiency. These will be discussed further with the CAA such that the CAA will be able to give clear guidance as to the limits of latitude NATS will be able to exercise.